The Entertainment Software Association today filed suit against the Chicago Transit Authority over the right to advertise certain video games on Chicago's buses and subways. The suit challenges the transit authority's prohibition against advertising computer and video games rated Mature or Adults Only. There is no such prohibition against advertising R-rated movies, mature TV shows or music. The association says the ban is a violation of the guarantees of free speech under the First Amendment to the United States Constitution. "The CTA's ordinance constitutes a clear violation of the constitutional rights of the entertainment software industry," said Michael D. Gallagher, CEO of the association. "Courts across the United States, including those in the CTA's own backyard, have ruled consistently that video games are entitled to the same First Amendment protections as other forms of entertainment. The CTA appears unwilling to recognize this established fact, and has shown a remarkable ignorance of the dynamism, creativity and expressive nature of computer and video games. The ESA will not sit idly by when the creative freedoms of our industry are threatened." 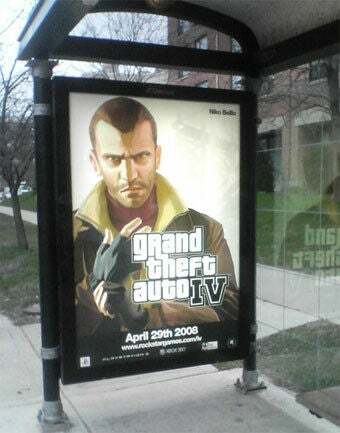 The ordinance was enacted in January, hitting just months after the authority reached a settlement with Rockstar Games that allowed the company to advertise Grand Theft Auto IV on their billboards for six weeks, as part of a settlement. A similar ordinance was overturned in Denver in 2007. The association's suit contends that the new Chicago ordinance unconstitutionally "restricts speech in a public forum that is otherwise open to all speakers without a compelling interest for doing so." and that the ordinance "impermissible discriminates on the basis of viewpoint and ignores less restrictive means of achieving the supposed ends of the ordinance." We've contacted the Chicago Transit Authority for comment and will update if and when they respond.